A shady flower bed in well drained soil is a terrific place for a submerged bucket or flower pot bin to make your very own worm bed or pit. Take a bucket or flower pot and and dig a hole deep enough for at least 1/2 to be underground. Turn your pot or bucket upside down and cut a hole in the top to feed worms and harvest castings. Your red wigglers will be able to stay cool in the Summer and warm in the Winter. This bin was started a year ago and has been outstanding. This bed made it through one of the coldest Texas Winters I can remember with temperatures hitting the mid teens on a couple of occasions. I pulled the stone covering the top in early Spring, and was pleasantly surprised to see tons of baby red worms going to work. 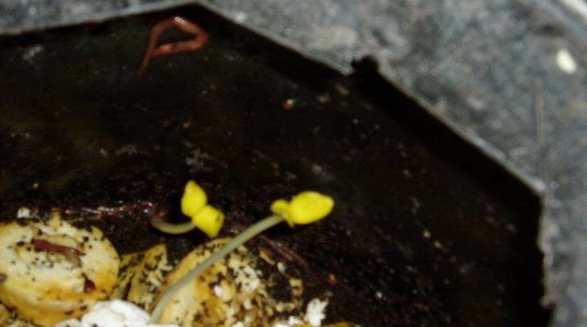 ← Used coffee grounds for compost and worm food.